The OpenCM9.04-C is the same as the OpenCM9.04-B except for the two TTL connectors (used for the AX series) has been replaced by two XL-Type TTL connectors (used for the XL-320). Both versions C and B are compatible with this firmware to connect with EZ-Builder. This controller is also used in the Robotis Bioloid Mini that can be controlled by EZ-Builder with this firmware. 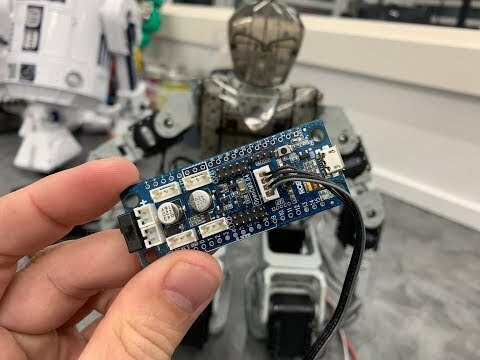 In this video, DJ demonstrates how to connect and control dynamixel AX-12 servos with the Open CM 9.04 in EZ-Builder using the Dynamixel plugin. There are step instructions below that define each step. The TTL servo ports of the Open CM 9.04 are UART #0 on the Dynamixel plugin. Ensure the plugin has the UART #0 selected for the TTL servo ports to work. Follow the instructions from Robotis to install Arduino IDE tools. If using Dynamixel servos, install the Dynamixel Servo Control into EZ-Builder. Set the Dynamixel plugin to use UART #0 for the Open CM 9.04. The suggested IDE for programming the OpenCM9.04 is the official Arduino IDE. The tutorial link below will recommend downloading and installing the Arduino IDE. However, you will also need to install the Robotis OpenCM libraries and tools into the IDE. The OpenCM9.04 can be programmed with the EZ-B firmware for a variety of capabilities when connected to EZ-Builder. The tutorial to program the EZ-B firmware can be found HERE. This hardware was added to EZ-Builder in this beta release and newer. The ports on the OpenCM perform different features based on their usage. The diagram above demonstrates how the ports are connected to EZ-Builder. The Ax ports can be either Analog Input or Digital I/O. The Ax also function as Dx ports. The UART 0, 1, & 2 are connected to UART 1, 2 & 3, respectively.